A romantic night under the stars is one thing, but a crystal clear view of the Northern Lights from your own private igloo is definitely another treat entirely. 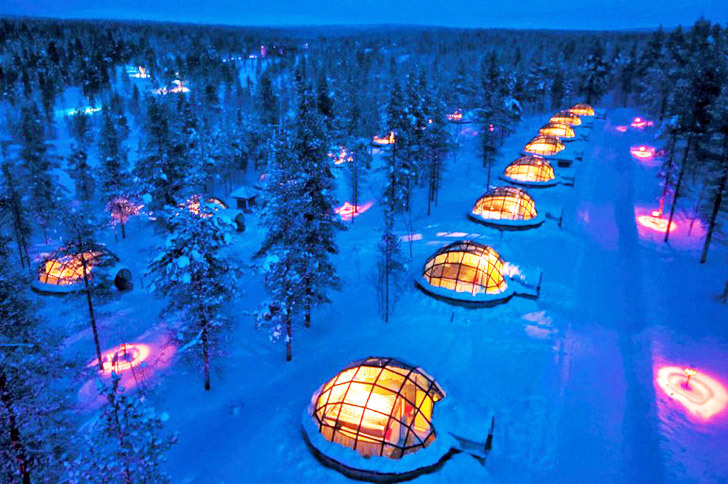 The Igloo Village of Hotel Kakslauttanen in Finland boasts 20 thermal glass igloos that allow visitors to enjoy incredible views of the Aurora Borealis from the warmth and comfort of their own hut. What is the cost to stay in one of these for 2 nights? How could i go about setting up a vaction here?? Pls help! This would be my dream, to come & see this !! How much, in U.S. dollars, would it cost, for a 6 day stay ?? Russell Higgins give me a break. Stay home then and let the rest of us enjoy. Any resort in an extreme environment that provides full climate control, such as this does, should not be allowed to tout their pseudo "eco conciousness" with catch phrases like "thermal glass" unchallanged. Not only will these leak heat like a smokestack in a -22 climate, but also LEAK LIGHT, so much for their claim to zero light pollution (well,except itself). To get eco bragging rights the hotel should not heat these, and lighting should be solely by flashlight. You go there to enjoy a NORTHERN treat, the POLAR lights, dress warm, expect to be cold, or just buy the DVD and stay home. But what are the rates? they don't seem to be listed..
Celestial theatre boxes. Sky-breaking capsules, on the ground. Lovely architecture. Nestled in the wilderness near Finland's Urho Kekkonen National Park, Hotel Kakslauttanen has one of the Arctic Circle's best views of the Aurora Borealis. The sparse trees and complete lack of light pollution reveal millions of stars each night, and during the peak winter months the location offers incredible views of the Northern Lights. Fitted for two people, the igloos are small enough to be efficiently heated without consuming too much energy. One of the world's seven natural wonders, Aurora Borealis results from the collision of gaseous particles from the earth's atmosphere with charged particles released from the sun. The resulting burst of colored light can last from less than a second to nearly two minutes. Though the lights are visible from August to April, the peak viewing time is in the darkness of the winter months. For the more adventurous, the hotel also offers lodging in a dozen traditional igloos made of ice. These ice houses have an internal temperature of only 21 degrees fahrenheit, so you better pack warm!